It was Cory Booker's constant sneering attack in the first New Jersey U.S. Senate debate - Steve Lonegan is a "tea party leader." What does that mean? It's true, Steve Lonegan has long been one of the Garden State's strongest leaders for fiscal responsibility, lower taxes, and constitutional government - the core values of the tea party. That Booker considers "tea party leader" an insult shows that he opposes these fundamental principles and that reflects negatively not on Lonegan but on Booker. Steve Lonegan's fiscal policy leadership has had major concrete benefits for New Jersey taxpayers. Lonegan galvanized opposition to corrupt Governor Jon Corzine's toll hike scam, which involved a long-term lease to a foreign corporation that would have been authorized to raise tolls 800% on the New Jersey Turnpike and the Garden State Parkway. Lonegan was even arrested on a public sidewalk peaceably protesting a Corzine toll-hike event; the police later apologized. Whether you live in New Jersey or are just driving through, you can thank Lonegan every time you pay a toll that could be much, much higher. Booker recently said he wished Corzine had been reelected. Lonegan led the fight against a $450 million bond issue for stem cell research that didn't have enough promise to attract private sector financing. The measure had a backdoor tax increase hidden inside that Lonegan exposed: it said the state must tax "real and personal property" if it lacked funds to pay principal and interest on the bonds. So Steve kept New Jersey from going deeper into debt and raising taxes, defeating a ballot question for the first time in nearly two decades. Booker has never seen a bond issue or tax hike he didn't like. That debate should have ended with Scott Brown's decisive special election win in Massachusetts, a seat that hadn't gone Republican in 40 years. But Democrats thwarted public opinion and circumvented that election by passing an unfinished mess of a discussion draft that had passed the Senate as an intermediate work product. Now we're suffering the consequences, with 850,000 people notified last week in New Jersey alone that they will lose their existing coverage and be forced into an exchange website that doesn't even work. Nationally, the number has to run well into the millions - proving false President Obama's infamous promise that "if you like your plan you can keep it." Republicans like Lonegan are now fighting for a one-year delay, so nobody is forced into a mess of a system that isn't ready. 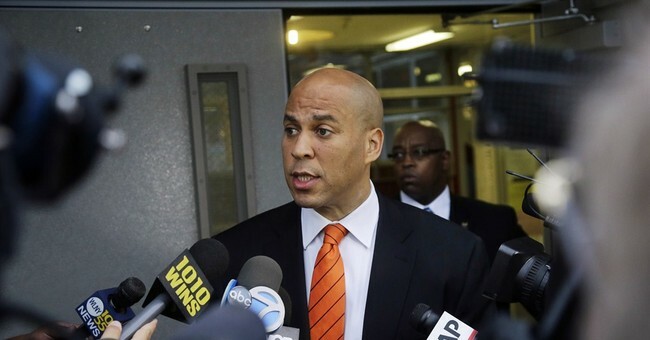 Booker, in lockstep with national Democrats, called Obamacare "great" and touted the pre-existing condition ban, which he seems unaware has been New Jersey law since 1992. The issues on which Lonegan has led have been the central issues of the tea party since it burst onto the national political scene in response to President Bush's Wall Street bailout and President Obama's stimulus. Fiscal responsibility, low taxes, and health care freedom are not fringe issues -- as the 2010 landslide showed. And if Steve Lonegan shocks the world on October 16, it will be because even in the most liberal of states, most people still believe in common-sense fiscal conservatism.